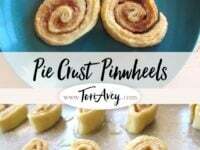 I thought these Pie Crust Pinwheels would be a fun way to “wrap up” my series on pie crust. These little cookies are a great way to use up those leftover trimmings from the crust-making process. It’s so easy that a kid can do it… in fact, it’s a great way to get kids involved in the pie making process. 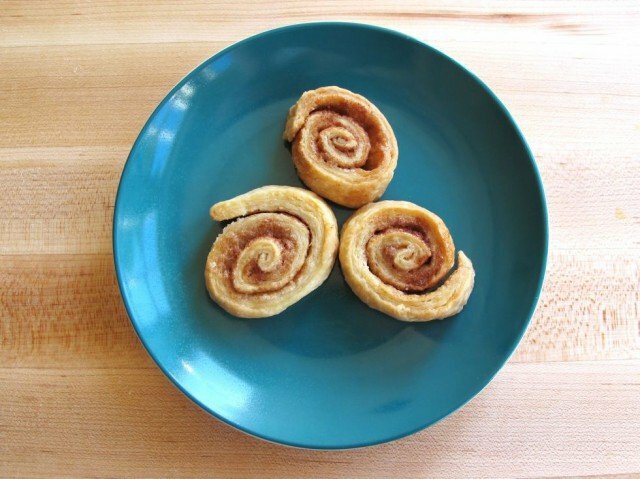 Growing up, we would always save the trimmings from homemade pie crust to make pinwheel cookies. 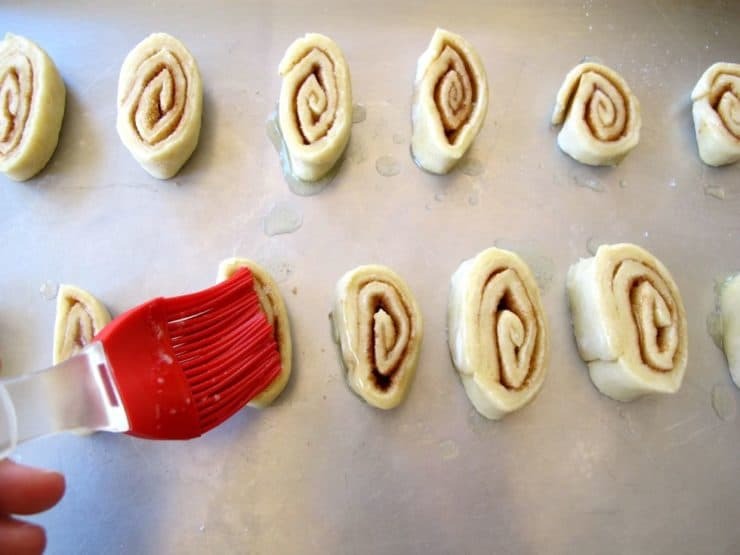 It was so easy– just spread the dough with butter, cinnamon and sugar, then roll and cut the cookies into little pinwheels. When we were done, we baked them until they turned flaky and crisp. They smell like heaven as they’re baking! Nothing better. To be honest, I looked forward to the pinwheel cookies more than the pie itself! 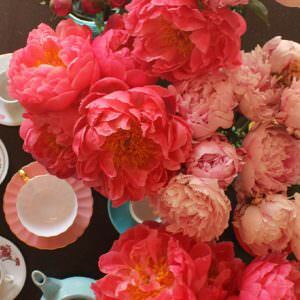 This recipe and tutorial will take you through the process step-by-step. I haven’t given specific measurements here, since the amount of dough you’re working with will vary based on the trimmings you have. To learn about the History of Pie in America, click here. What do you do with your leftover pie trimmings? 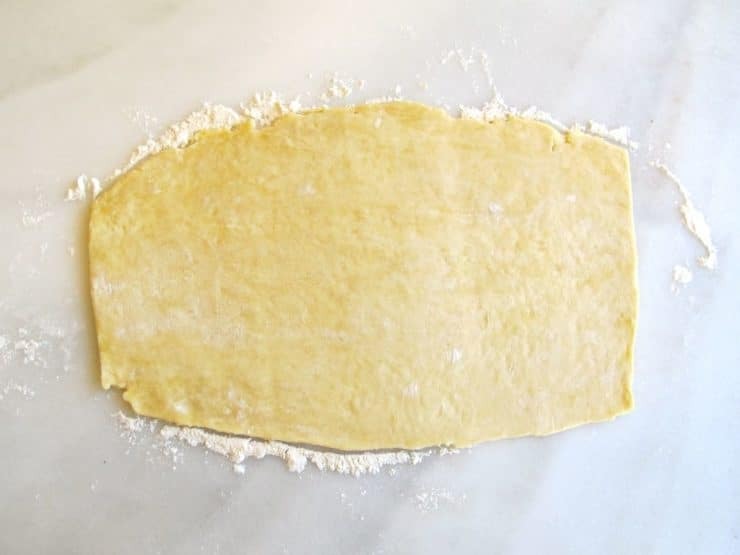 To learn how to make an Old Fashioned All-Butter Pie Crust, click here. Use the trimmings from your pie crust to make delicious cinnamon-sugar cookies - Pie Crust Pinwheels. Easy and kid-friendly vintage recipe. Preheat your oven to 350 degrees F. Gather your pie trimmings into a ball. 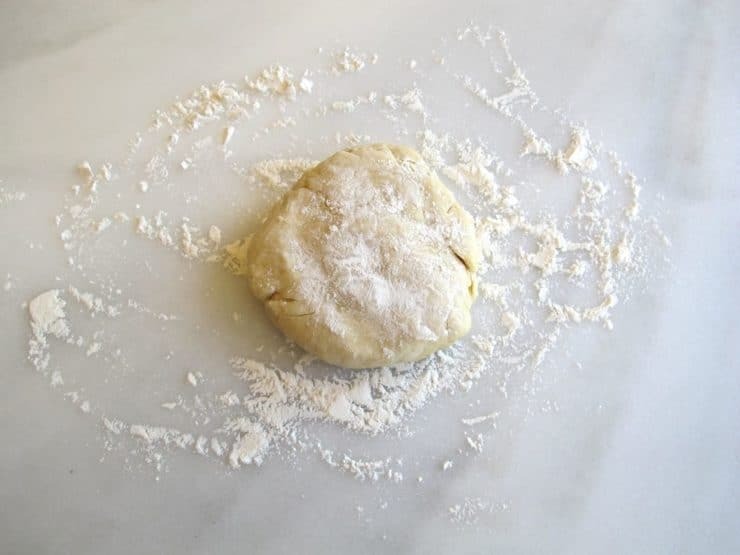 Lightly flour your rolling surface and the top of the dough ball. 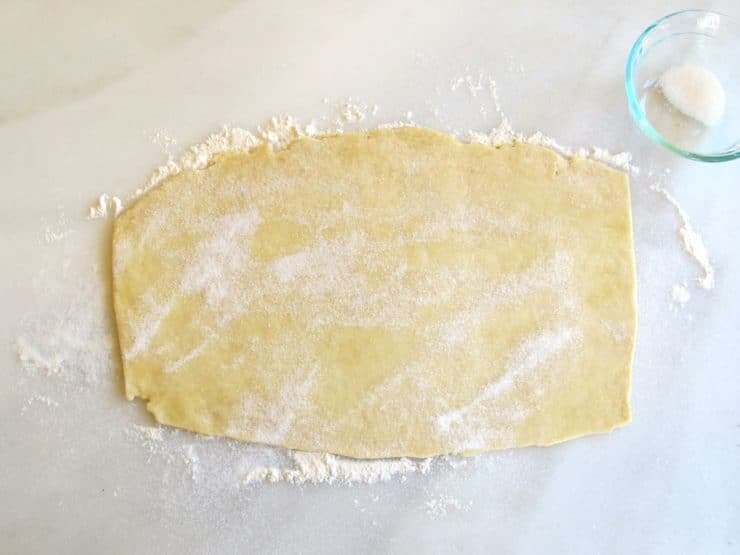 Roll the dough out into the rough shape of a long thin rectangle. Cut the two short, rounded sides to form a straight edge on either end of the rectangle. 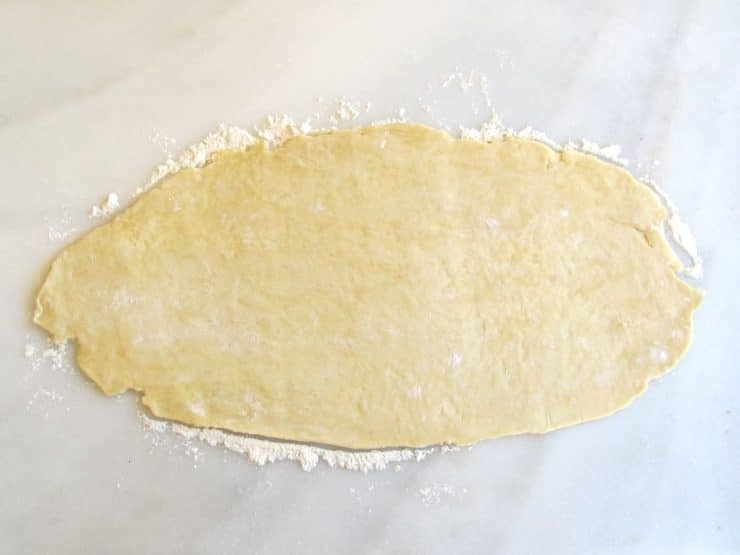 Dust the flour off the top of the dough, then spread it evenly with melted butter to coat the entire surface. Sprinkle it with sugar, then with cinnamon. Roll the rectangle up horizontally into a long, thin tube. This will make several small pinwheels cookies. Alternatively, you could roll it vertically to make larger cookies; you will end up with fewer cookies this way. 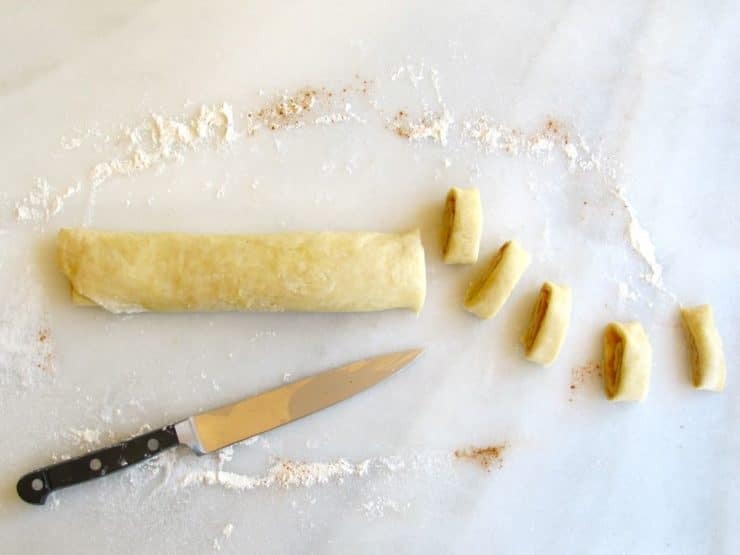 Slice the tube into cookies. Place cookies swirl-side up onto an ungreased baking sheet. Spread the top of each cookie with a little more melted butter. Sprinkle them with a little extra sugar for good measure. Bake the cookies for 30-45 minutes till the edges are golden brown and the cookies are crisp. Baking time will vary based on how big the cookies were cut. Remove from oven and allow to cool. Serve. They go great with an ice cold glass of milk. My mother made these but always called them “leftovers for meddlers.” I have never heard that term used elsewhere. Like other posters, we kids loved these and still remember the smell of them baking and their delicious taste! We are allergic to cinnamon, so I used cocoa powder and brown sugar. If the smell is anything to go by, they are going to be delicious! How many calories are in about 4 of these? My Grandmother past in 1972 when I was a young child. She would make the best homemade noodles for chicken and noodles. She also made the best pies. She would make the best pies and my favorite part of the day was when she made the penn wheel cookies. I haven’t had them since then. Thank you for brining back a great memory from my childhood. She was a tough old lady, but she sure could cook. I heard a fantastic German word for these pinwheels on NPR’s “A way with words”. Of course, I can’t remember that word 🙁 And it was so cool. Does anyone know that word? Oh love these. I have a frozen pie crust left over. Was wondering if that would work too. Thanks for amazing recipes. My gran still makes these. They were always a bonus on days when she made pies. The best were just the brown sugar ones, but they are also yummy with peanut butter. Great Idea, thanks so much. These are great using any kind of jam/preserves you like instead of the cinnamon sugar. My mother used to make these as well and we too preferred them over the pie itself. We called them Rolly-Pollies. If memory serves me correctly, I believe they were rolled up as pictured but not into a pinwheel but twisted before putting on the cookie sheet. I make these all the time. My children were raised having these every time I made a pie. Now for special occasions I will make a whole cookie sheet for each of my sons who are now grown with families of their own. You would think that I am giving them a bag of gold! My mom used to use pie crust scraps spread PBandJ on them and cook them. My mother used make these and called them “Bubbe pleasers”. As a girl that just didn’t make sense to me..what the heck is a bubbe? However, since we have studied Scriptures and Hebrew and become Messianic, it makes me wonder if there were some Bubbes in my mother’s family, because she did not know what a Bubbe was either! Ha! Now I am Bubbe! My Mom used to make basically the same thing only she used my little pie pans and made them pies. Can still taste them and will soon make them for myself. They were always a very special treat. Our mother used to line the bottom of the pan with butter, lots of chopped up walnuts, brown sugar and cinnamon, so that our cinnamon rolls (from leftover pie dough were little sticky buns (but better than the ones I see in stores). I grew up in New England where my grandmother taught me to make pies. We always used the leftover dough to make these. I make them with my children and grandchildren now. What wonderful memories!! Thanks so much for reminding me – my mom made these, too, and I loved them, and loved “helping” her make pies, when I am sure I was more hindrance than help. 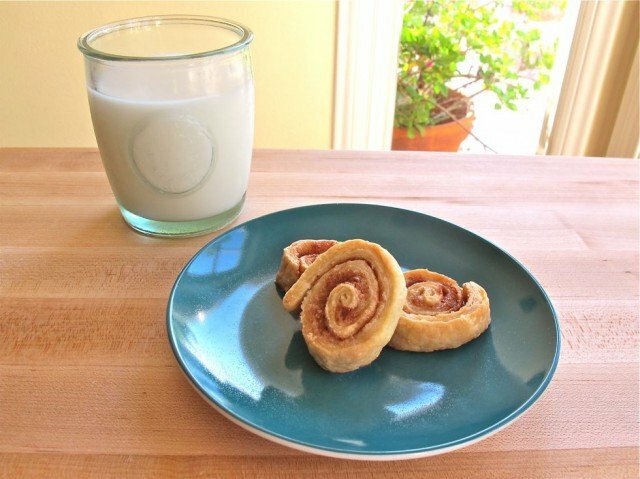 I’ll be making cinnamon pinwheels this weekend with my 2 year old granddaughter, and I am sure somewhere, my mom is smiling. Ohhhh my…What I would give to be back in the kitchen with my mother, making pies, when I was a little girl. 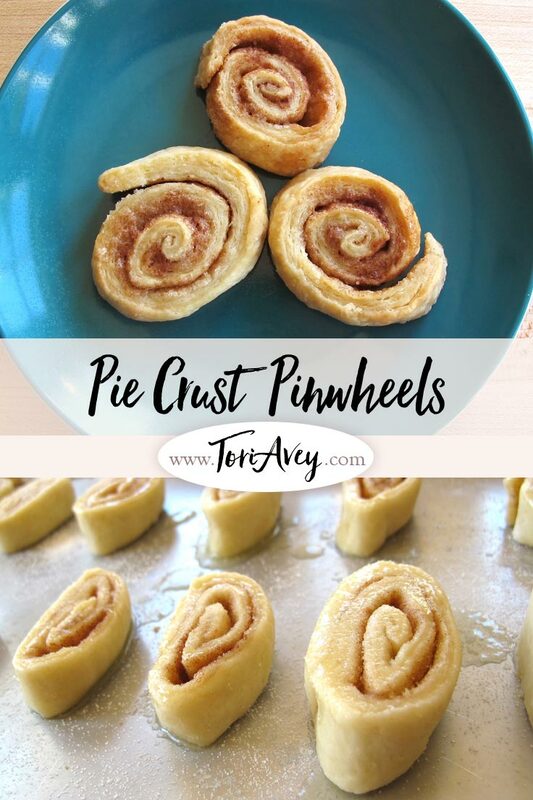 I didn’t care for pies, but just waiting until she put the pie in the oven….AND, rolling out the excess dough, knowing she was going to make the pinwheels. Mmmmmm, I can still taste them. 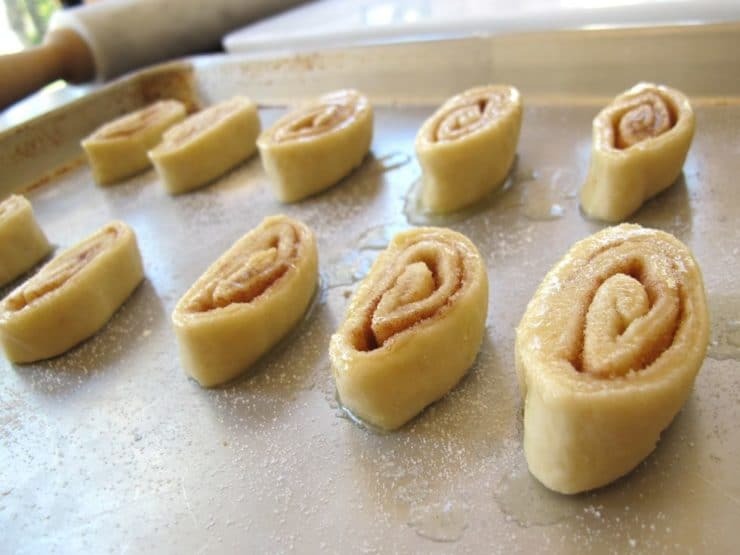 Think I’ll go and make some pie crust now….For pinwheels. 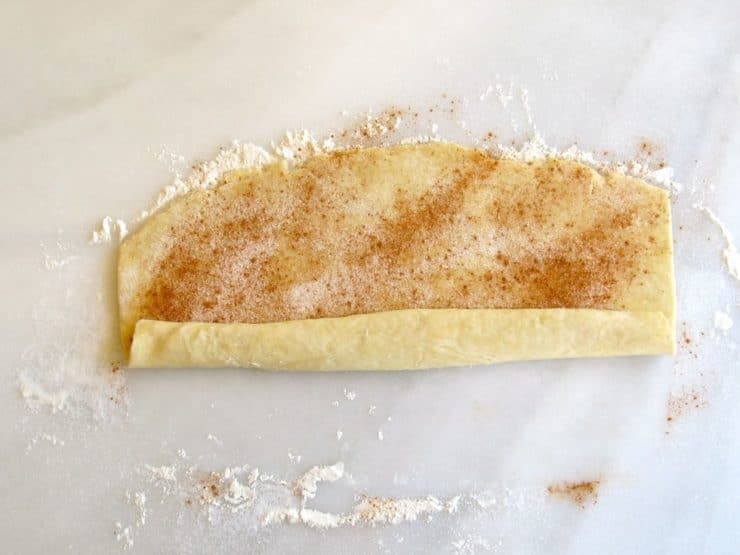 much baking as i was growing up and we had these cinnemon rolls at least once a wk.from left over pastry,and we kids loved this better than pies.she also made home made bread or rolls every day and we hurried from school to eat it.brings back many good memories. I am an 11 year old girl and I was playing hooky one day when I asked my mom if I could use the leftover pie crust in the fridge. When she said yes I scoured the internet ( searched ‘pie crust dough recipes’ on google) and found the best cookie dough recipe ever. YOURS! Thank you so much! Can’t wait to make this with my little cousins and sister! THANK YOU! These are a popular treat in Quebec, where they call them Pets de soeur (nun’s farts). Those look great. I love cinnamon. My grandma and I always used to make small snickerdoddle cookies with the left over pie crusts. They would puff up and turn a beautiful golden brown. All we needed was cinnamon, sugar and leftover dough. It was so much fun to be in the kitchen where all the action was happening when I was a little kid, and making these cookies really made me feel like I was involved too. I miss the simplicity of those cookies and of those earlier times. My mom makes the best pie crust. I am still learning (okay, so what if I’m over 50?) She cut the leftover crust into strips and we sprinkled them with cinnamon sugar and baked them. I guess that’s why I have a jar of cinnamon sugar in the pantry, and the last pie I baked from scratch (at least the crust) was, what, 15 years ago? Okay, well, that’s just brilliant. 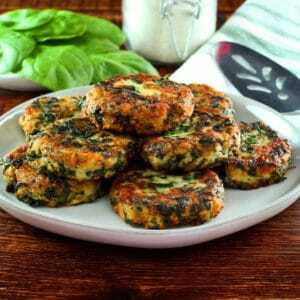 Another wonderful recipe Tori. I love the look of this one. 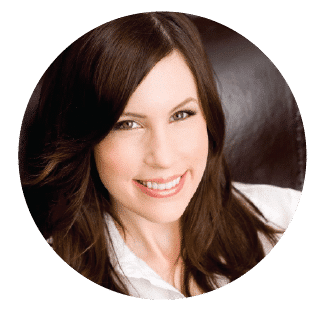 You must have incredible light in your kitchen. So jealous of your pics. My house is so gloomy, no light. These take me back. My mom used to make these all the time with her leftover pie dough. So tasty. It is funny that so many of us remember the treats from the excess pie crust rather than the pie itself! 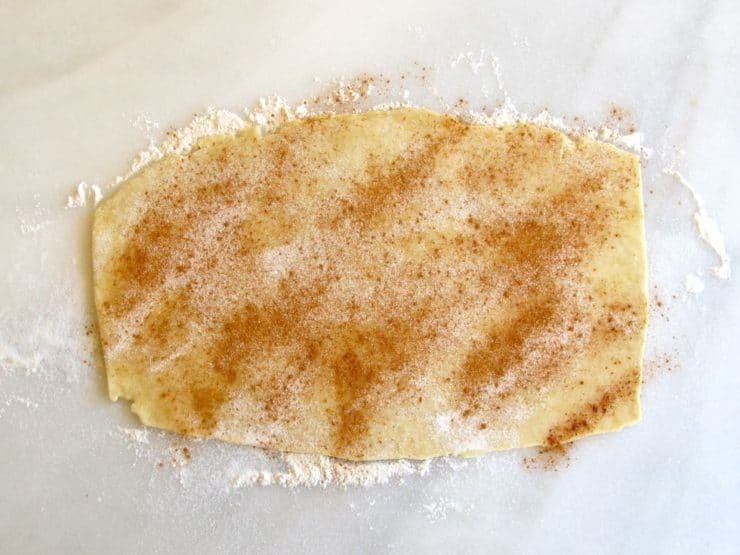 Nothing like flaky dough with cinnamon-buzz buzz! That cinnamon inside is so lovey and can imagine the fragrant and smell once done with the baking. That is a great idea! They look yummy too! Aww this reminded me of my grandmother!!! She made these too (therefore, of course my mom did as well). We called them “gobble-ups” because you could “gobble them up” quickly after they baked! 😉 One of my favorite memories. Thanks for the smile! This brought back memories! Cooking with my mom from the time I was 9 years old in NY, she made “bowties” with the leftover pie crust dough. Same thing, with the cinnamon, sugar and butter. Funny, in doing research on my mom’s maiden name, it came up everywhere as being Ashkenazi. Meanwhile, I used to say to her so often, “Mom, you’re like a typical Jewish mother, only we aren’t Jewish!” She was such a, what I called, ‘Sarah Heartburn’. I’d even put my arm over my forehead, and say, “Mom, you forgot to do THIS!” Also, her fave candy was Joyva Halva. So,,,,,perhaps will never know. She passed away in 1996. She made me crazy, but I miss her! She and my grandmother, Sophia, were phenomenal cooks. I owe all my expertise, and cooking awards, to them! I’m presently writing a cookbook myself, and as I’m an artist (hence the “rtiste”) am illustrating it myself, as well. Blessings, Veronica. I remember those! My father used to make pies every once in a while and he took the pie crust scraps, spread peanut butter on them and baked! It’s funny…he’s elderly and every time I make a pie he tells me what to do with the pie crust scraps – as if it was the first time…. ….Thank you for such a lovely food memory!